For those who prefer a more active holiday, there are numerous possiblities for sports and recreational activities in Croatia. You can choose between cycling, horseback riding, rafting, canoeing and kayaking, diving, water skiing, surfing, tennis, beach volleyball, and many more. Cycling is very popular in Croatia. There are many wonderful cycling routes, from the mountains and valleys of sunny Istria, trails through the forest of Gorski Kotar, the hills and vineyards of Hrvatsko Zagorje, and last but not least, the spectacular Dalmatian coast. Discover and see Croatia in a way that few visitors see it. On a horseback you will be able to visit towns and charming villages that many tourists miss. Travel across the countryside through farms and meadows, forests and hills, and experience breathtaking views of the Adriatic Sea. Rafting on the waterways of Croatia is adventure and fun. The magic of the rivers and its crystal clear dephts are unforgettable. Among the most visited rivers are Kupa, Cetina and Dobra. Croatia has over a thousand islands, some of which are considered to be the most beautiful in the world. A dream destination for kayakers. Canoeing on the rivers of Croatia is fun for the whole family and also a cultural experience if you discover and investigate the numerous impressive caves. The dephts and shores of the Adriatic Sea are a real treasure and offer the very rich underwaterlife that is typically for the Mediterranean. The history left here some very interesting traces and you will be amazed by the breathtaking natural beauty of the sea. 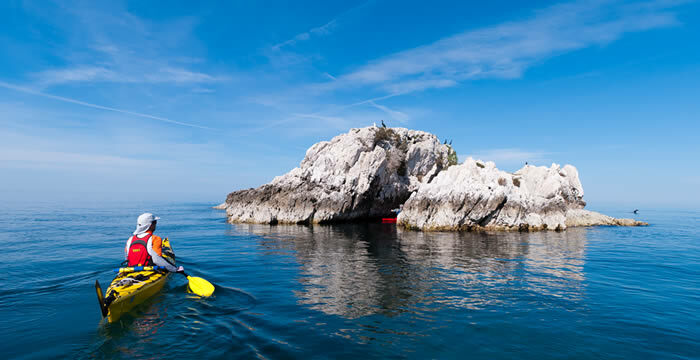 The Adriatic is a relatively calm sea, with no high waves or strong currents, In combination with the clear water are this ideal conditions to discover and explore coral reefs, caves and wrecks inhabited by many colourful fishes and other creatures. Most resorts in Croatia offer a spectacular choice of watersports such as waterskiing, boat rides, and scuba diving. The truly wonderful thing about waterskiing? The combination of the warm sun and the water at the same time, floating on the waves and enjoying the nature and wonderful smells of the Mediterranean. Throughout the years Croatia Open has established itself as one of the most prestigious competitions of its class in the world of professional tennis. The world success of Croatian tennis players along with the ATP tournaments have greatly contributed to the popularisation of tennis in Croatia, which the result that in every tourist destination can be found nowadays tennis courts. On croatian beaches you can enjoy beach volleyball, a sport that is very popular for the last few years. Beach volleyball is a great activity to enjoy with your friends and family during the warm and sunny summer.